Photo credit: Edmund Clark, In Place of Hate, Ikon Gallery, 2017. Photo: Handover Agency. Edmund Clark teaches postgraduate students at the London College of Communication, part of University of the Arts London. For four years Clark has been artist-in-residence in Europe’s only wholly therapeutic prison, HMP Grendon. Edmund Clark’s work links issues of history, politics and representation through a range of references and forms including photography, video, documents, found images and other material. A recurring theme is engaging with state censorship to represent unseen experiences, spaces and processes of control in contemporary conflict and other contexts. Clark has published six books and been exhibited widely including in major solo museum exhibitions at the International Center of Photography Museum, New York, the Imperial War Museum, London, and Zephyr Raum für Fotografie, Reiss-Engelhorn-Museen, and Mannheim. 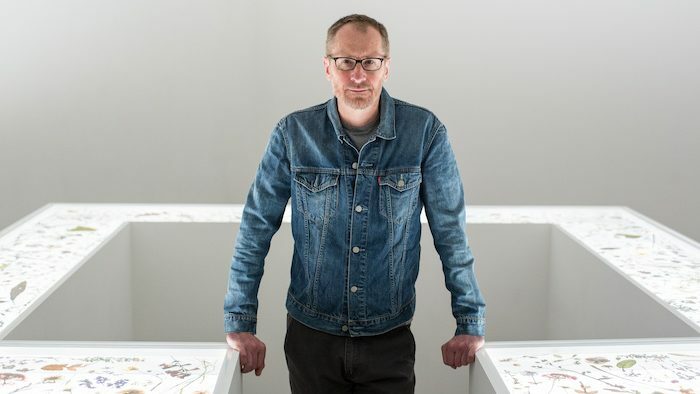 His work has been acquired for national and international collections including the ICP Museum and the George Eastman House Museum in America and the National Portrait Gallery, the Imperial War Museum and the National Media Museum in Great Britain. Awards include the Royal Photographic Society Hood Medal for outstanding photography for public service, the British Journal of Photography International Photography Award and, together with Crofton Black, an ICP Infinity Award and the inaugural Rencontres d’Arles Photo-Text Book Award. Where do you see the most exciting work happening in your field? People who are looking for visual strategies and making work that explores developments in contemporary global conflict, particularly in relation to technologies which mean these conflicts are not really seen on our screens or defined meaningfully in the media. There are often no longer conventional troops openly on the ground. This means there is little media representation of where these conflicts are taking place, and what these technologies are doing. One theme I am interested in is how technologies are making contemporary conflict personal. The individual can, so we are told, be targeted and taken out. It is about the body becoming a battlefield, either through targeting or the interrogation of the individual. Part of the work I’ve done around secret prisons and Guantanamo is about retribution on the body itself. It becomes personal, it becomes about the body. Interrogation or torture are acts of punishment as well as information seeking. The subject is assumed to be guilty of something because they are resisting the imparting of knowledge that may incriminate them. How do people make work about these subjects? How does the visual artist make works that brings these processes, these experiences, battlefields to an audience? It is about different materials, people who are making interesting work are combining all sorts of different materials, source material which they have made or found, critical theory, video, phone imagery. There is such a richness out there which means you can be very creative about how to make work and how to show it. There is a wide choice of opportunities in terms of forms that are conceptually relevant. It is not just about being someone with a camera. Often within my own work there are images which I often haven’t made but are made by other processes which actually do something that photographs cannot do to show the richness and complexity of the subject beyond the simple image on screen. The world and society I live in have changed quite fundamentally over a short period of time. I think the experience of living with terror and the measures which are deemed necessary to respond to the real and perceived threat of terror, in our name, have led to some significant changes in our ethical, legal and cultural norms and standards. The defence of the state and its citizens is the primary role of the person elected to national office. But it is hard to square the circle of a culture that says it is the beacon of justice and fairness, which then locks people of another religion up, doesn’t give them due process and broadcasts that fact around the world. You can’t say one and do other. It is also troubling that governments you have elected and people who represent you are deeply implicated in illegal processes which are obscured by in-exactitude, economy of the truth, partial revelation or complete secrecy. Your work can be said to expose state practices which largely go ‘unseen’ as part of the war on terror, methodological and stylistically, how do you go about documenting ‘unseen experiences’? My work seeks visual strategies to try and counter some of the prevailing representations of these practices and bring out some of the narratives which are going on behind these representations. So the work on the CIA secret prison program, that I made in collaboration with Crofton Black, is not about torture or waterboarding it is about extraordinary rendition, about who was responsible for running and managing the process and where it took place. It reveals a process which is about very ordinary people making very simple decisions, but it is also at another level about terror and how that insinuates itself into daily life. How do you think the United States government attempts to make and allow us to see the practices of the war on terror, including torture and extraordinary rendition. How do you want people to see these practices differently thorough your work? Negative publicity is, in a sense, about recreating a network of very mundane things, small business facades in Washington, small airfields, redacted houses where people live, the insides of houses where people who have been held in prisons now live. It is about a network of mundanity. That mundanity is charged with its relationship to this global geopolitical event which indicates the US and other western governments’ complicity in extrajudicial detention, interrogation and torture. This is not something that happens far away run by some exotic agency that has nothing to do with you. Actually, it has a lot to do with you. It is taking place all around you. The work I did about a control order house in the UK, is about an archetypal suburban house in a provincial city, in which someone who is suspected of being a terrorist is housed. It could be your next-door neighbour. But they are being held by the state without due legal process on a suspicion based on secret evidence. Other work is about the process of revelation and secrecy. ‘198/2000’ an installation currently in New York, comprises images made by the American military which is a form of documentation of the abuse which has taken place in the prisons in Afghanistan and Iraq. The ACLU has tried to get these images released since 2004, and finally last year 198 photos out of about 2000 were released. They are extraordinary images, a lot are redacted, blurred, out of focus, rescanned and turned into PDFs. They are visually quite extraordinary, but they are images which are part revelation, but also, again, part secrecy. They are images that are made by the protagonist, by the people that are doing the abusing but that don’t really reveal anything very extreme which is counter to the reports of abuse that have taken place. This means we are left with an impression of partial openness together with an assumption of cover up and the existence of images that show far worse; with the implication of worse but obscured state violence. That is itself, perhaps, an act of terror. In the installation I have a four-screen projection within which these images appear on the four walls, and as you stand there, at some point, you will be touched by these images. That is about trying to make people see this unseen process, this documentation of a partially visualised process and understanding it is about them, that they are complicit in it. It is not detached from them, it is all about us and the system we live in. The quotidian and the ordinary are seemingly central, rather than ignored as inconspicuous in your work. Do you a see a particular turn in visual politics, from showing and boasting spectacular displays of state power outright, to de-dramatisation and concealment? They are certainly new types of imagery: imagery of confinement and political incarceration and there is a lot of material there but it is not always necessarily looked at. Our media is very careful in terms of what is seen but there is a lot of material available online that is never shown. The spectacle is not always one about state power. The war on terror started before 9/11, but what happened on that day, the resonance of those images, those two iconic towers and what they represent as a system and a way of belief, being destroyed was something way beyond the capacity for people to control or understand. It was a huge image defeat, an image trauma. It is not necessarily the use of the screen-based media to show images of state power, as more implicit messages and assumptions go with those forms of representation, or their absence. One of my strategies for using material which is quite mundane and quotidian is to create a visual antidote to those binary propagandistic representations and to look at the complexities, to get behind the screen, and look at processes that perhaps we can relate to by bringing them down to an everyday more human level, to experiences we can all identify with. How do you conceive of your relationship with the people whose environments you depict? Would you say that you have a responsibility towards them when you are visualising these practices? I definitely do feel a sense of responsibility and privilege in some ways to be given access some of the places I have been. That might sound very strange. But to go and work in a control order house, to go and work in Guantanamo Bay, to be given access to people’s lives is both a responsibility and a privilege. To be able to say something about them is a privilege. I do feel a responsibility to make work that hopefully engages an audience long enough and interestingly enough for them to want to rethink, revisit how they understand these subjects and how they think about these subjects. To alter the discourse around them. That is a responsibility: not to perpetuate but to reconfigure. The UK Home Office said yes to your request for access to the control order house, while you were granted access to Guantanamo Bay, albeit with restrictions upon what you could photograph. Why do you think they did? Were you conscious of any political benefit of rendering visible a practice which is largely secret and unknown? The news media were being allowed into Guantanamo Bay and I went with the backing of a British magazine. I was granted access at a time when Obama had come to power with the message that he was going to close it within a year. There was relative openness and the aim to show that they were treating people appropriately. Which is slightly bizarre. There is a bureaucratic process for the media to go through to get access to Guantanamo. It includes agreeing to work with a digital camera, to not photograph certain things and to having your images seen and censored on the day. In regards to the control order house, I’m not sure, really, why they let me in there. The lawyers I was working with were very surprised. I have two possible hunches. One is that everything I had made had to be seen by the government, so potentially I was making evidence about this person, maybe they thought it would reveal something. Second they thought that, from a legal perspective, it was less aggravation letting me in with the caveats they required than adding further conditions to the control order to prevent it. The controlled person had to make the application through his lawyers so once he had agreed saying no was perhaps more problematic than letting me get on with it. Did the possibility that your photographs of the control order house could be used as evidence in the case of the detainee change your stylistic choices/ approach or selection of what to photograph? No. I had very limited time there. The conditions which were actually applied to me was that the publication of my work must not reveal the identity of the controlled person or the location of the control order house and that people who know him or know the house must not be able to make a connection through my work to that fact. Conceptually that potentially renders it impossible to visualise anything. In any photograph of the interior someone may recognise something, any photograph of his possessions may contain something identifiable. So I was making work thinking I may not be able to use any of this. I did make some images purely about surface, about details about wallpapers about textures, which I thought they couldn’t possibly object to. When I sent all the images to the Home Office and I didn’t know what they were going to say. Even if it were a ‘no’ to all the material I would have still used it in some way. I would have represented that form of control through 500 black rectangles for example. I thought they might go through all the photographs and perform a kind of curation in which they removed certain images. This would have been really interesting. I would have had a set of images that would have been curated by a faceless, nameless, control order officer. But in the end, they said that as long as nothing revealed his name, his address, or any names or addresses of anyone related to the building or Home Office then I could use the images. There was the proviso that if his anonymity is broken through the publication of the work then I would be liable to prosecution. There is an absence of bodies in your works (from those of Bagram Airbase, to Guantanamo and the Control Order House), which are, fundamentally, about the control of bodies, what is your thinking in this approach? There are several reasons why few people appear in my images. The extraordinary rendition work is about a process and what that reveals about the world I live in. It is not about highlighting individual cases. The voices and narratives of the individuals caught up in this process emerge through the material Crofton Black and I selected and through the connections we encourage the viewer or reader to make. This work is about the façade, the black rectangle, the strikeout, the limits of photography, and by going to the limits of photography which shows nothing to underline the presence of what you can’t see behind those black rectangles and facades: bodies in pain. All that work is about the body in pain, in trauma. ‘The Mountains of Majeed’ is about the experience of large numbers of people involved in the process of occupation and resistance in Afghanistan seen through the landscapes of my photographs and Majeed’s paintings. ‘Control Order House’ cannot identify the controlled person. With the earlier Guantanamo work there were a range of factors involved: censorship of images identifying individual detainees or guards in the camps; the unwillingness of some ex-detainees to be photographed and importantly, the toxicity at that time of the image of the bearded Arab or South Asian male. Does that image actually engage the viewer in a way that makes them sympathetic to the predicament that that person had been through? Does it just show a 2D representation (even if that person is innocent) of who they think a terrorist is and what they look like? Is it like a mirror for stereotypical preconceptions to be reflected back to the viewer? By contrast, by looking at where people live, by looking at spaces which we all have experiences of, is a way of drawing audiences in. You see places you recognise and this makes you look closer. Mixing these places up to evoke a sense of disorientation makes it complex, different, and visually strange – while connecting the viewer with the key technique of the behaviour management plan for detainees through these familiar spaces. What is the most important advice you could give to young artists interested in challenging state power through visual media? Think carefully about ideas of propaganda and representation and how these subjects have been seen and are being seen, and what people, the different audiences, might know about them. You have to see through everyone else’s eyes in order to understand how you have to see for yourself in order to change what people look at and how people see these subjects. Think very carefully about where you place your work, how much control you have over your work and how it is contextualised.